Rab town is a subject of many written and told accounts, mainly focusing on it’s most recent history. Rab Croatia indeed has intriguing legends and mythology behind itself, first time being mentioned and mapped by the Greek seafarers and geographers all the way back in 4th century before Christ. Greek seafarer Skilaks mentions islands Rab and Pag in a single name as “Mentorides” in his written account “Periplus” (literally meaning sailing around). Some artefacts, like an ancient fishing hook, stone axes and knives found on Rab island, suggest a much longer history. Such artefacts are kept in the Archaeological Museum of Zadar among other found in North Dalmatia. But let’s start with what you might find interesting in the heart of the island at present time as a tourist. 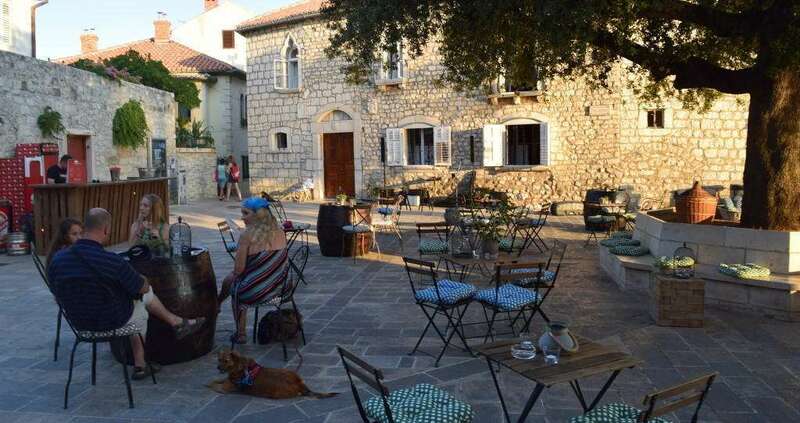 Town of Rab Croatia has a central position on the island and you will find there most activity, biggest concentration of restaurants, shopping locations and events. During the day, it is a Mediterranean cobweb of activity and touristic places, but not yet so crowded like say, Dubrovnik or Venice. The shaded spots along the port and the promenade is where you may enjoy a great time while having a coffee or ice cream. Plaatsen langs de haven van Rab Kroatië, net als de jazzclub “Moderato” of “Oude stad Bar” met hun terrassen zijn zeer smaakvol ingericht en geplaatst tegen de pieren, dus je kan observeren passerende boten en jachten. Langs de waterkant is ook waar de andere bars en clubs, en de wisselwerking tussen het geluid van de golven, jachten aangemeerd en het leven van de stad zorgt voor een geweldige sfeer. Een groot plein genaamd “Municipium Arba” is het centrum van de stad en het eiland autoriteiten. Op dit plein kunt u ook genieten van de avonden zitten op de terrassen van clubs als “San Antonio” of romantischer één, “Conte Nero”. 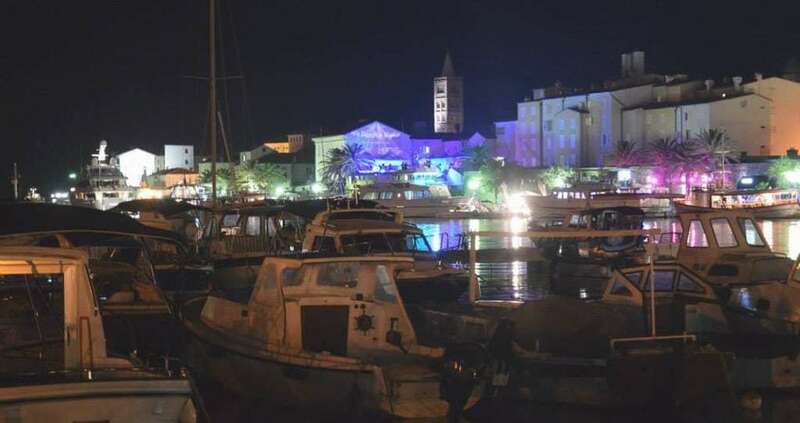 U zult langs de waterkant vindt u enkele van de meest prominente boot touroperators, en kan een dagelijkse boottocht te plannen naar de naburige eilanden Pag of Losinj, of rond Rab zelf. Als u doorgaat met het einde van de waterkant vindt u een luxe hotel “Arbiana” en ernaast een ingang via een stenen boog vinden in een groen park “Kaldanac” dat een aardige schaduw op een warme dag biedt. As you go back toward the town from the park, you’ll come directly to “Srednja ulica” (Middle street). 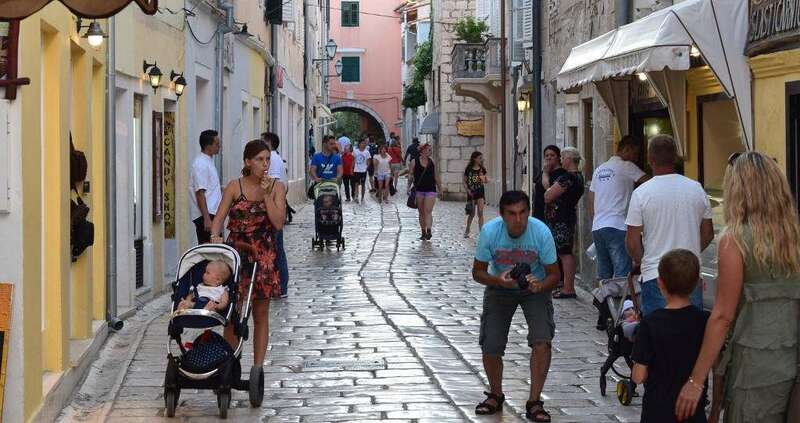 Here you have the widest stone covered street of the old town and most visited, with many shops, boutiques, gelaterias. As you continue to the end of “Srednja ulica”, you arrive to another square, called “Varos”. Here you may find a line of open air shops and stands, painters on the open and large stairs ascending up to the Fort and the Church of St. Christopher. Going all the way to the top of the fort gives you a great view of the town from the North side. This is however, still not the best view you’ll find to overlook the town. The large stairs are still not the only way to ascend to the Fort and the “Gornja ulica” (Upper Street). Once you have ascended the Upper Street, you may continue along the street to visit the four towers, or bell towers, as they are lined up, with their respective churches. The first tower as you pass the Fort is the Tower and the remains of the church of St. John the Evangelist (Crkva Sv. Ivana Evanđelista). It has been built in Pre-Christian period and renovated but later in 19th century turned to ruins. At the place of the old church you will also find large stone plates with Roman inscriptions beside the original church columns. Second tower as you walk along the street is one by the Church of St. Justina. This church has been closed in 1808 but has very recently been renovated and now has a museum that exhibits sacral art. Ornaments such as the skull of St. Christopher (or rather Christ-bearer) – protector Saint of island Rab. You may also hear music as you pass by the church. Don’t worry, it’s not the medieval ghosts, it’s the music school right there next to the church premises (or I like to think so). 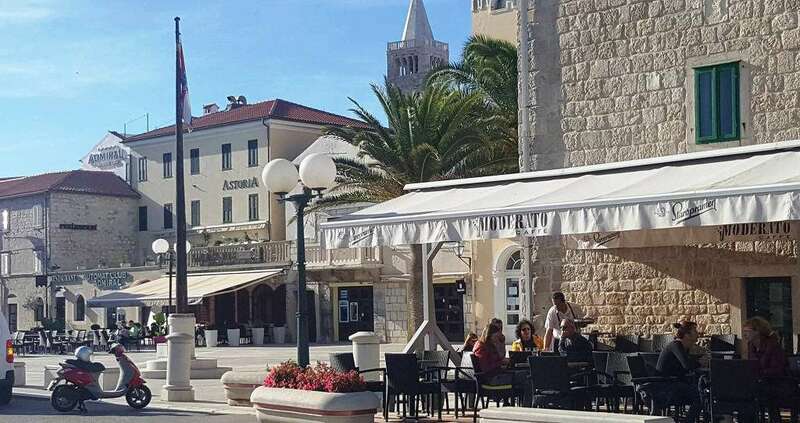 As you walk on, you’ll pass over the “Liberty Square”, displaying a beautiful view of the sea below city walls and some Venetian style buildings around. With such balconies and the view, you may feel as if being in Venice for a moment. Next is the tower by the Monastery of St. Andreas (Samostan Sv. Andrije). It is the oldest of the four bell towers, being built back in the early 11th century. And shortly after that we arrive to the tower by the bell tower of St. Mary, close to the church of St. Mary’s ascension. It is the largest of the four towers, and open to the public but not at all times. It is possible to get by stairs and levels to the very top, and even above the tower bells. You may check at the entrance the working hours. From here, the view of the town is truly impressive, with 360 degree view of the town on one side, and neighbouring island Pag, and open seas on the other side. The port with yachts stacked along the docks, and the web of light from the Mediterranean streets below on a summer evening. This bell tower alone also has a story, and the first time it was mentioned was back in year 1212. Tower had it’s top changed due to being struck by lightning and destroyed in 15th century. The new top has eight sides instead of four, and many inscriptions with the names of saints, like St. Barbara, protector from storms. 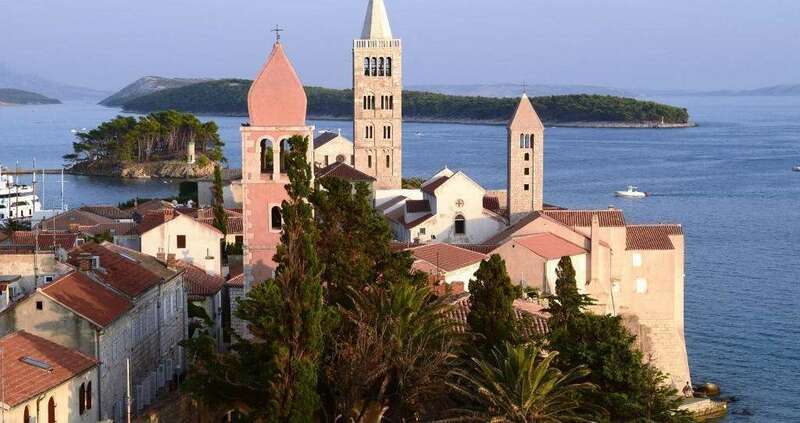 Close to the tower is the Romanesque church of St. Mary’s, the most elaborate and beautiful of the churches on Rab, having a status of cathedral until 1828. hurch was canonised in 1175 by pope Alexander III, while on his path from Zadar to Venice. Croatian typical elements like braiding are found on the church as well.